We Montessorians never tire of running contrary to cultural expectations. Whether it’s introducing sounds at age 3, discouraging dramatic play in favor of real activities, or delaying fantasy and fairy tale stories until elementary school, we’re always making waves. One such area is that of celebrating holidays. I’ve seen some schools go to extreme lengths to avoid holidays; for instance, on Halloween, kids don’t wear costumes (even for a short time), no Valentines are exchanged on Valentine’s Day, and no crafts are made as presents for Mother’s and Father’s Day. I have to take issue with this kind of avoidance. Holidays are important for many reasons, and children should be able to celebrate them in some way during school time. I’m not saying that holiday decorations need to be plastered around the classroom, or that whole weeks or months should be devoted to them (as is sometimes done in traditional education), but there is a place for remembering them. As the saying goes, “Everything in moderation”. So it is with our holiday celebrations. What I like to do is decide which holidays we’re going to celebrate (not all of them need to be mentioned every year) and then choose one book or project (or both) that best fits the holiday. The ages of the children determine how much you will study. A young child might be interested in a simple story about leprechauns on St. Patrick’s Day; an older child may want to research the origins of the holiday and study a bit about Ireland. With Valentine’s Day coming up, please consider having the children exchange simple valentines with each other. You can ask that they be homemade instead of store bought (to avoid “character” merchandise), and that each child bring one for every other child to avoid popularity contents. They can be as simple as a square of construction paper or cardstock with a hand-drawn heart. Sugary snacks are never a requirement for holiday celebrations; the focus should be on special rituals (songs, stories, poems, and crafts) and a shared sense of excitement and celebration. If you’d like to involve food in your celebrations, choose a dish that is related to the cultural origins of the holiday. Have the children help you prepare it rather than buying treats from the store. 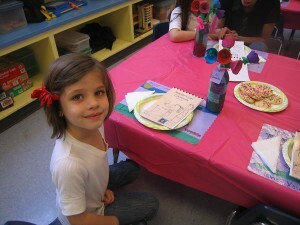 In Montessori, birthdays are always special. They are a chance for even the youngest child to begin to understand the concept of the passage of time and what “a year” means. Often, a lamp or light will be placed in the middle of a circle (you can use a yellow ball for this too). The children will form a circle around the lamp or ball and the birthday child will hold a globe. The number of times the children circle around the lamp is determined by the age of the child. While you’re circling, you can say (or sing), “The earth goes around the sun” once for each time the children circle the lamp. This is a wonderful example of our solar year, which was created thousands of years ago when humans began keeping track of how long it took for the earth to revolve around the sun. So, do you think that Montessori classrooms should celebrate holidays? And if so, what is the best way to do that?